Hollywood and royalty are rarely seen together, but we all knew the wedding of Meghan Markle and Prince Harry today would create the most unique opportunity for a union of A-listers of every kind. If you think regular wedding guest outfit codes are hard to crack, imagine throwing the world's glare into the mix. The requested dress was "day dress and hats" which translates into more sensible knee-length dressing (we saw many jewel colours, bright hues and pretty prints) and many neat pieces of millinery (although some guests did go all-out with head-turning gear). In a relatively casual move, gents were asked to wear military regalia, lounge suits or morning suits. According to the Instagram Stories of Meghan's girlfriends it looked like many attendees were still perfecting their looks late last night (around 2 a.m.) alongside a tailor—this was clearly not an event where anything would "just do". Victoria Beckham is already part of the monarchic crew, having attended Kate and William's nuptials in Wesminster Abbey back in 2011 (remember her chic navy maternity look, topped off with a matching fascinator?) and she was of course in situ once more today, not only as a guest but also with the prospect of a Spice Girls performance at the wedding reception. Seven years later and the esteemed designer once again dialled up the fashion credibility of the occasion with a similar look—a slinky navy dress worn with bold red shoes. Catherine, Duchess of Cambridge, didn't disappoint either. The last time we saw Kate's wedding guest style was last year at her sister Pippa's wedding when she opted for a pretty blush Alexander McQueen dress and matching accessories. Today her sister opted for a pretty mint-green floral number from London-based brand, The Fold. Of course, there were many more starry names and stylish looks to chart (we spotted beautiful frocks from the likes of cool, niche labels such as Alessandra Rich and The Vampire's Wife), and we've got them all below. 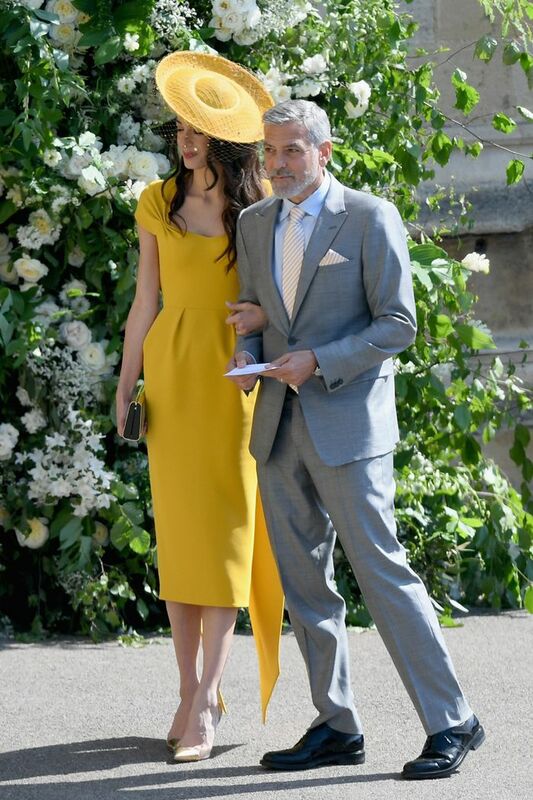 From Amal Clooney (so WOW in yellow) to Priyanka Chopra (in a spectacular Phillip Treacy hat and custom-made Vivienne Westwood suit), Carey Mulligan to Oprah keep scrolling to see who attended the royal wedding and what they decided to wear on such a big day.